I’m writing this post RIGHT after uploading the previous ones. Hopefully I will be able to start off early, and top up later on. As I’m typing away, my edited photos are already uploading on flickr to be shared here with this post. 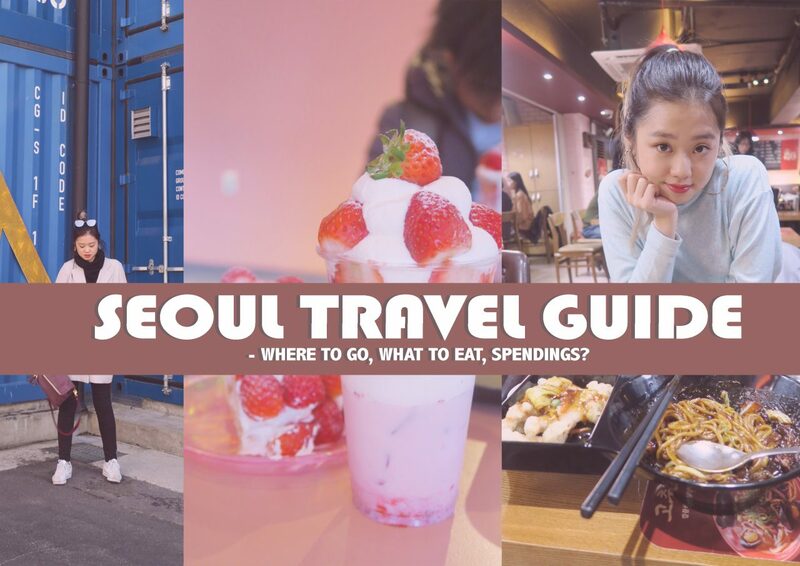 Today’s blogpost should be quite visual as there’s nothing much to share – but I just want to say that that we shifted Day 4’s itinerary to Dongdaemun for the whole day as we were quite stretched out from Ihwa. We needed a day where we would just chill so we just chose one place. I chose this place because weather was alright and we needed a clear day to enjoy the rose exhibition at night. My dad always pumped up to start the day off. Check out his Nikes haha. Mom usually more chill – but this is probably us waiting for Nick to come out. At the lift area where our AirBNB studio apartment is. Love the lighting here, skin looks awesome. To start of the day, we already planned beforehand to come together to get takeaways. If you’re in Seoul, you just NEED to experience a takeaway in order to feel like a local. And when it comes to takeaways, it has to be jjajangmyun (black bean noodles). Our place was a little too small for 10 people, so we headed over to the Mings at THEIR airbnb house. Omg their place was SO pretty. It was a fully decorated house with 3 rooms and it nicely fit all of them. When you walk in the house there’s also a nice woody smell to it that makes the whole place smells so cosy. Their host just lives right below them – so its SO helpful! We went to their place in the morning. And this was what welcomed us. The two boys outside just recording Kendama shots. This was pretty much how things went throughout the whole trip. This area was the alley that their house was at. You see the wooden house on the right where Ming Han is sitting. Thats the house. SO PREETS. I wish I took a photo. We then asked their host if he could order the jjajangmyun for us. I also ordered a tangsuyook (sweet and sour pork) and the host asked for some free dumplings as service. Man, when the food came – there was SO MUCH food. He gave us at least three plates of dumplings for free and we couldn’t finish everything on the table. All the food for 10 pax. 6 jjajangmyun, one LARGE tangsuyook, and some free dumplings. How it looks like all laid on the table. Man. It was a rainy day, so we waited till the rain went off. Parents were talking and I remember it was the day Pacquiao and Mayweather’s fight was on. We all watched it while waiting for the rain to stop, but it kept on drizzling. My family brought an umbrella, so we headed back to our studio (which was only about 10 minutes walk away) first before meeting up about 30 minutes later at the subway station. So yes – for those who wants to learn how to reload a T-Money Card with these machines that don’t operate in English yet, here’s your guidance! For foreigners, it’s quite important to get a T-Money so its more convenient and it’s a lot cheaper travelling around as you get transport transfer discounts. So it you get off the subway and hop onto another bus in probably the next 15 minutes – your ride is either free or probably a top up of 200 won depending on your distance. This machine sells the traveller T-Money Card but i highly recommend AGAINST it. I remember the card being sold for a higher price as they come with coupon vouchers for all the tourist spots. 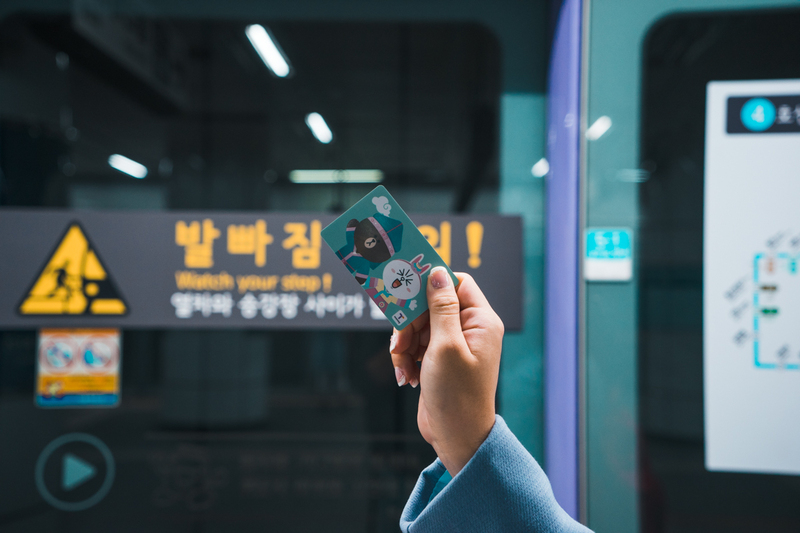 If you already have your itinerary planned and don’t plan to get to the palaces and whatnot, a normal empty T-Money card can be bought at convenience stores at about 2000 Won. Just ask for T-Money, and give them about 10,000 won to reload. 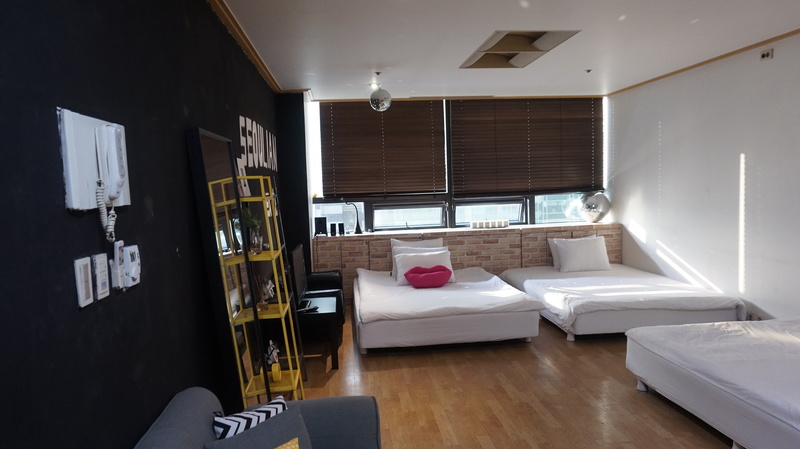 Probably will cost you about 12,000 Won in total and you can travel for maybe about 10 trips (subway & bus!) before you got to reload again. You should keep the card, because I feel like nobody ever goes to Seoul only once 😛 Save your money. Step 1 : Press on the orange tab. There’s still English here so you should be good. For those who wants to save the hassle of getting a T-Money at a convenience store, just press the purple tab and your card should come in a box. Step 2 : To reload or check your T-Money balance, simply put your card into the machine and it’ll automatically scan and identify your card’s information. Direction of card shouldn’t matter. Step 3: Just click on your preferred reload amount adn you’re good to go! Good to have at least more than 5000 won in the card, just to be safe! It’s so simple even my brother can do it himself. And he reads no Korean. Since it was a rainy day, we decided to just get to Dongdaemun Design Plaza where we could be indoors for a little while more incase it was going to drizzle. To get here, just take the subway to Dongdaemun History & Culture Park Station (Seoul Subway Line 2, 4 ,5) and get out at Exit 1. You should be able to see the building upon exit. Just look around for abit. Looks so grand and huge. I don’t know what about it that’s so…attractive, but I was just staring at it when we first got there. How did they BUILD this thing? What is it supposed to be. So apparently it’s a few building combined together, so just imagine that this huge oval UFO lookaliek thing is like a shell that houses these different entities. Although separate, they mostly focus on arts – just different types of art. This was all before we got out to admire the structure of the place by its external form. We decided to just walk from top to bottom and look at the building before it gets dark. We wanted to see it at day and night so we went straight for that. Was afraid that it’ll be gloomy again and it wouldn’t look as nice. We walked out of this little hole and was like WOAHHHH WHAT IS THIS. It’s like you’re in outer space, but not really. Your brain is just not used to building in such form. It’s so polished looking, but you can’t find a reason to explain why was it built that way. Let’s just enjoy and stop trying to judge art. But hey, that fella who imagined this in his head before building it – you deserve more cheese and bacon in your life. Good job there buddy. We took lots of photos before walking to the highest floor and getting our way down. Well, we also took a lot of photos inside. And outside. And almost every part of the building. I guess it’s only fair to post a some of those that we took, to justify the photo spam. After looking at it from afar, we walked up and ended up at this grassy area. Don’t know what’s supposed to be in this area but they have a lot of space to hold events and exhibitions. Pretty smart design I must say. Strolled through that just looking at everything from a higher view. We then got inside the building. I think this was probably the 4th floor or something. The cool thing about the building is that you can choose to take the stairs down, level by level. You can also just walk along the pathway that spirals down every floor. It’s this wide white area that smells like new paint. I also suddenly recognised the place from a drama my Mom was watching. It was pretty cool, felt like Deja Vu – just not mine. I think the first area we walked into was sort of a Kids Area where everything is just colourful. There was also a(nother) public piano for the kids to just slam their little fingers on to make beautiful music. Actually there was this kid that was playing REAL scores from like Mozart or something, and his mom was just looking on to him with the “NO MISTAKES SON, NO MISTAKES” stare. So much pressure pfft. Everything was so white and clean. Feels like I cannot make any noise here also. This is the spiralling pathway that takes us to the lowest floor, level by level. One of the stools cushioned by leather scraps rolled together. Look at this rest stops where they put the golden bunnies. So the kids have the colorful ones and when you’re adult enough, golden bunnies please. Doesn’t this look like the perfect place to hold a red carpet or something. It has an X factor. After visiting the Dongdaemun Design Plaza, we headed opposite to where all the shopping outlets were for dinner. We walked over to Doota which was at the far right and went straight up to the food court because nobody knew what was there to eat. And you know, at the food court everybody gets to choose whatever they want. I got myself a jjolmyeon – which is a spicy cold noodle. It was really spicy, but i LOVED it. The noodles were chewy and the sauce had a lot of flavor too. I think I got this for about 8000 won or something. After dinner, we headed back to the Dongdaemun Design Plaza because my friend told me that there was a LED Rose Exhibition going on when we were there. You should probably check out if it’s still happening during your travelling period so you don’t miss out. We didn’t see this side of DDP so I had to ask the information counter where it was. Roses in Korean are called jangmi. So you can probably just say “LED Jangmi oddisoyo?” Wah the whole stretch of roses were just SOOOOO pretty! I took lots of similiar photos but I’m just going to post them all because I can’t decide on which one to post because they all look pretty to me. Lots of LED roses coming your way. WHITE LED ROSES! It’s pretty hard to get a good shot if you’re not good with the camera. I tried pulling up the ISO but there was too much noise in the photo and it didn’t look pretty at all. Everyone was trying to get a photo with the roses but they all turned out to just be shadows amongst the roses lol. My dad took some and the first one turned out quite eerie haha! SEE! We then decided to just put our phone flashlights to good use and give him some lighting support lol!! So two of us were shining the flash on his face so we can see his bright little smile and still see the roses in their glory behind. What do you think? I also took some panaromic shots from the night that I wanted to just put in the post! There was about 20,000 roses all around the area, separated into two lanes. We only walked one lane since it was pretty much the same. It was a simple exhibition, but really beautiful to just slowly stroll through. After taking what probably felt like 2000 photos, we decided to just look out for the Cheonggyecheon River. I read that it was supposed to be nearby so I asked everybody if they could do a little bit more of walking. Everybody was up for it so I quickly asked for directions. I’m the type that wouldn’t mind asking for directions every minute along the way just to make sure. To my surprise, probably only 2/5 people I asked knew where it was. The worst part was, I asked his shop owner where the river was and he said he didn’t know. The river turned out to just be less than 100m away from his shop. Can we all please give a moment of silence for this man. Anyway, I wanted to come to the river because it’s really pretty at night and if you walk along the river the whole way to the end (this was the other end) you would see different structures of the river and probably some lantern exhibition or something if you’re lucky! Go look it up. After all that walking, we all went back to Hongdae. My family decided to just take a walk at the busy area at Exit 9. After some shopping, we went to the pojangmacha (road side stalls) to just grab a few things to takeaway and eat back up in the studio. Man, I’d kill for this cart to be at my doorstep every night just ready for me to grab a stick or two. I love the fish cakes, the soup that comes with it, the fried egg that comes with the sauce, the rice cake. 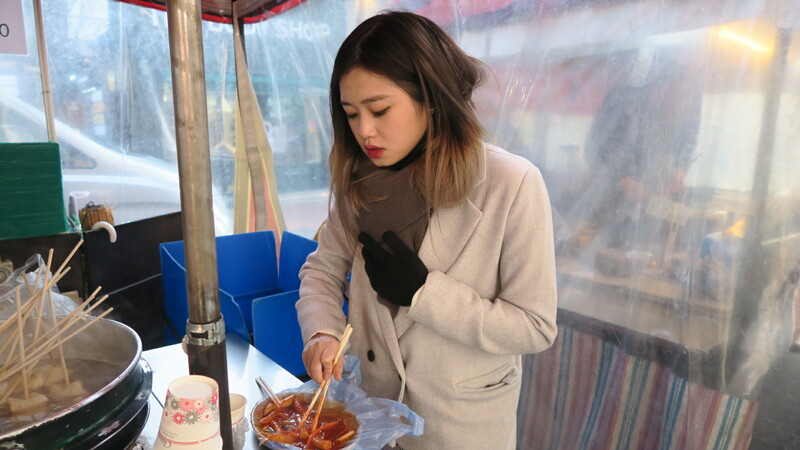 Everything in here was just yums to the max – especially in cold weather. I CANT WAIT TO GO BACK TO EAT THIS! We ate some at the stall, and took some back home. We also went to buy one of the spiciest Korean noodle as I really wanted Nick to try it. He’s always up for spicy challenges so this one was one of those that I really wanted to put him through. You should see his face when he took his first few bites. After that it was just down the drain. Next thing you know, he was infront of the fan trying to cool himself down. It’s called Buldalg-Bokkeum-Myeon. SO NOMMY though. I tried it, can’t take it, but I love it. Nick’s noodle before he gobbled EVERYTHING up. This guys no joke for spicy challenges. And that pretty much wraps up Day 4! If you’d like to watch the day in video form, here’s my vlog for the day! This entry was posted in Korea, Lifestyle. Stuck in a decision of whether to go to Korea for its local delicacies or to visit Malaysia for its rich heritage? Fret not, as this time you can have both decisions in your pocket as I’m about to tell you where you can get some good Korean yummy’s right here in Malaysia so you don’t have to confuse yourself! For local Malaysians, if you are tired of all the bibimbap’s and barbeques and think that’s all that to Korean delicacies, prepare to be introduced to a whole new type of the super wide umbrella of Korean food. Here, I have my favorite Korean restaurant that I go to in KL and no, they do not serve your typical kimchi soup or beef bulgogi. 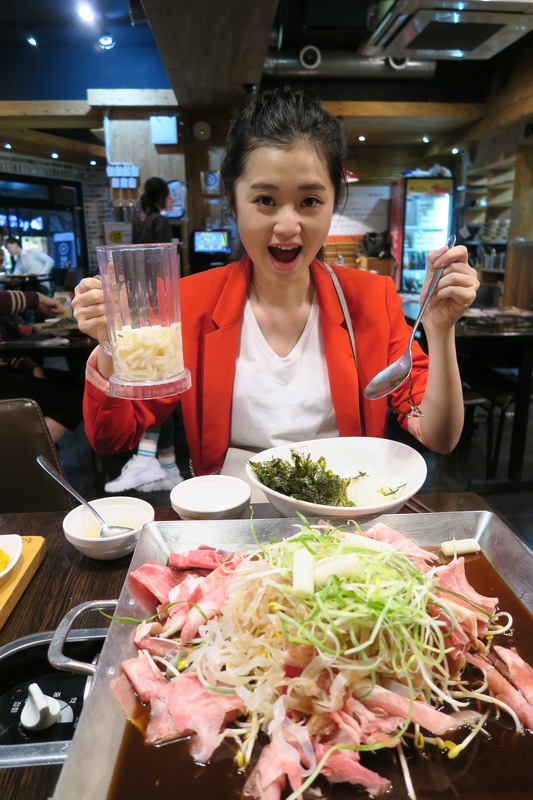 I have only visited 2 Korean restaurants loyally in KL – one is because the food is really good (this), and the other because the food was really cheap. The restaurant is run by a family of pure Koreans and with that you can guarantee your food will definitely be of the authentic roots of the culture. Their ingredients are also imported from Korea so you need not worry about how the local the dish may turn out! From the MRR2, you’d have to go the road opposite Tesco and turn in into where the yellow apartments are. The turning is almost right opposite the Shell petrol station in MRR2. You’ll see this upon turning. A little after this, go straight and you’ll come across a traffic light that has Carrefour’s market on the left. Make a left U-turn and go straight up till the end. The restaurant will be on your right and it looks like this. The clean restaurant with both floor and tables seats for your choice. First, you have to decide if you want to have a spicy or non-spicy dish. Non spicy is RM 19 per t portion, where as spicy is RM 22 per portion. For hot eaters – specially request for REALLY HOT – you’d go home feeling like a volcano teehee. Second, decide how many portions you want. Normally 1 portion is for each pax but as my family members are usually quite small eaters – we don’t normally order 4 portions for 4. Maybe you’d like to order 3 just incase you can’t finish. Well, for those who are thinking to only add portions after your meal – think again as you will need to have a minimum of 2 paxes for each additional portion order. But if you think you will be able to finish – go for it! Third, choose your Sa-Ri’s to compliment the basics that are already in the menu (cabbages, sweet potato, rice cakes, chicken), you should decide on what you’d like to add on to your meal. The rice is for the second phase of the meal (to be explained later) so you can either choose to have Ramen or Udong as your accompaniment. Mushroom, Sweet potato and rice cakes can also be added for an extra charge. Step 2: Enjoy the free refreshments that are provided by all Korean restaurants. Now you don’t have to worry about having to order drinks! Step 4: Enjoy having your food cooked right infront of you! Food is ready to be eaten. The waiter/waitress will notify you when it’s done so don’t worry about having to guess when to eat it! Step 5 : Always remember to accompany the dish with these to enhance the taste of the food! If you still feel a little hungry after your meal, dont worry! If I were you, I’d be more afraid to NOT be hungry because I always want to have that last combo of the whole set – fried rice! For only RM 6 per portion, you get to have some fried rice (that is only to be served AFTER you finish about 80% your initial order). It’s not your typical anchovies fried rice. If you observe closely, it has lettuces, seaweed slices and most importantly – every Korean restaurant’s secret weapon – the special red sauce! For OCDs, don’t worry about the pan being dirty or the sauce from the previous dish would remain at the pan when they fry your rice! Before every fried rice serving, they gladly clean your pan for you (includes scraping) so that you’d have a fresh scent of the rice! Personally I’d advice you to just order 1 portion for 2 person because the portion is quite big. But indeed, if you’re quite a big eater – 2 for 2 is adequate! Done! You can also wrap the rice in lettuce. No worries if you ran out of lettuce. Koreans are very generous so just lift your hands a little and ask for another plate – no charge! See why I love it here? Here’s a map for your guidance! I have no idea what this cafe was called but it definitely was just one of the random cafe’s we walked into in Seoul. Basically 70% of the cafes are nicely themed as most of the students usually chill in these places to study for an upcoming exam or to chit chat. It’s very important to have a really comfortable setting in your cafe as these people usually sit in for hours. I loved the cafe’s in Seoul when I was still studying there, simply because it’s usually very peaceful – like some study cafes you might see in KL. Basically, it’s like all their cafe’s are study cafes! This particular one that I walked into was completely white washed and the amount of white in the place was almost blinding. It’s like you just walked into an area of fresh snow – if only they had fluorescent lights it would be completely white. Good thing they had installed yellow lights to lessen the eye pain – although just by a little bit. ITZ SO WAIT IM GONNA DAI!! Couples usually like to snuggle up with the curtain draped down. We ordered this to share, some really good drink pfft. The best thing was that we get a slice of cake totally free if we purchase a cup of anything. Not to mention, it wasn’t just the low cost pandan sponge cakes. We could choose from a wide range of quality cakes – but we chose tiramisu, which was perfectto considering the fact that I’m not a fan of confectioneries. That’s me idolozing Dawn’s phone. I love long lean flip phones. LOVE! Good function! Directly mirrored self cam convenience! These photos are long overdue but I had no time to filter them so here are another set of photos from my 17-18 day trip! These are random shots from different days I suppose, I’ll caption them as I go along. So long since I posted many many interesting photos anyway, right? So here are some for you while I get busy with an upcoming event and some assignments. Finally found time to post these up! A cup of noodles while I wait for my laundry to be done. It was a long vacation so I didn’t bring different sets of clothes for each day. I washed them every 5-6 days and it was pure fun! Love the drying machine – hope we had one of that at home! This is Myeong Dong for sure. Thats the mom with the moving deco for a ramen shop! It goes up and down! Very cute I only wished I had recorded it. Streets of Myeong Dong. For those who have been curious as to what does the ‘normal’ Korean look like, here you go! Ever so popular ice cream vendor. There are about 10-15 of these shops here but this one always has long queues. It was the World Cup season and Adidas had an event where you queue to open up lockers in this room and get to win something. If you’re lucky you get their jerseys and if not, just two small keychains. Look at the queue! Here’s one thing interesting about Seoul. There are always these enthusiastic ‘usherers’ infront of the cosmetic shops. They always lure you in with a doorgift (yes! every single person who walks in) and when I used to be in Seoul and was short of cotton wools, I’d just pretend to talk in then I’d get 3 weeks worth of cotton wools TEEHEE. Well, I DID mention that these ‘usherers’ were ENTHUSIASTIC. Sometimes I have to pull really hard to make them let go of my wrist! Krispy Kreme in Seoul is just love! Always glazed evenly with sweetness of the right level on goldem brown doughnuts. Perfection. I spent an hour (while waiting for a friend) infront of the glass just watching them do their work. So hygienic and systematic. Look at the glazing process! ..so I took some shots of the vendors. Here’s one of the ‘kedai runcits’ teehee. We watched this man do his thing from above and was so tempted to try so we bought teehee. It’s fried glass noodles (japchae) wrapped in fried flour(?). Not as nice as we imagined it to be tho. One of the unique displays for a soap outlet. Streets of Myeong Dong so filled with people. Grandpas in Seoul are always so chic! Reminds me of the 70s. Norm in Seoul. They always sit FAAAAAAAAR apart pfft. Tired and exhausted from all the walking. Do you see the ahpeks behind? They are people you want to stay away from most of the time because they’re normally drunk and always talk nonsense. I was so afraid of them the first few weeks I was there (when I was still studying in Seoul) but later I just got used to them pfft. They won’t harm you, but just keep nagging or talking to you especially if you’re alone. Descending from the train. One of the photos I took especially for Abigail. 2AM as the public commuter’s ambassadors.